The Deer River Lions work hard to fulfill the Lion's motto "We Serve" in everything they do. Whether working to support a local high school activity or raising funds to fight blindness around the world, the Deer River Lions take pride in making a difference. The following is a list of the activities, causes, and charities the Deer River Lions will contribute to in 2010. If you would like to help us help others by making a monetary donation, please click on the "Contact Us" tab for information. 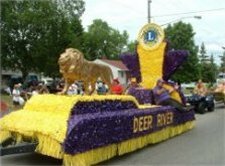 Donations may be made either to a specific program or at large to be used at the discretion of the Deer River Lions Club.